Keith Devlin at a mathematical exposition summit in Oregon in 1997. 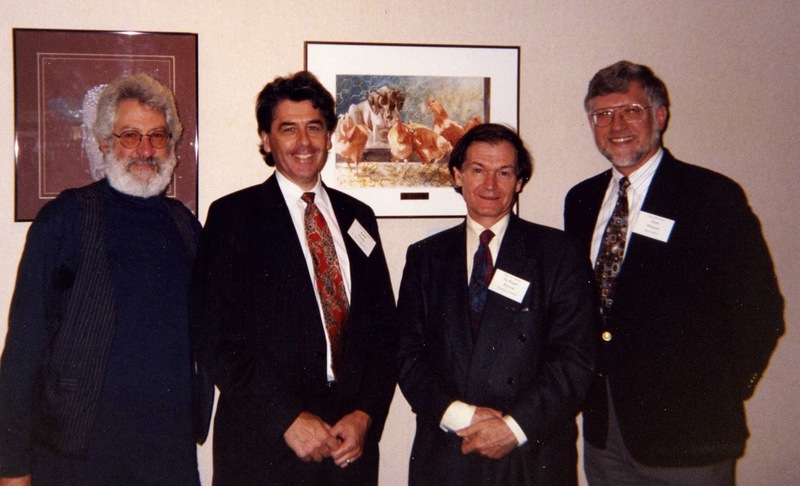 L to R: Ralph Abraham (Univ of California at Santa Cruz), Devlin, Roger Penrose (Univ of Oxford, UK), and Ivars Peterson (past MAA Director of Publications for Journals and Communications). One of the innovations I made when I took over as MAA FOCUS editor in September 1991 was the inclusion of an editorial (written by me) in each issue. Though my ten-times-a-year essays were very much my own personal opinion, they were subject to editorial control by the organization's Executive Director, supported by an MAA oversight committee, both of which had approved my suggestion to do this. Over the years, the editorials generated no small amount of controversy, sometimes based on a particular editorial content, and other times on the more general principle of whether an editor’s personal opinion had a proper place in a professional organization's newsletter. As to the latter issue, I am not sure anyone’s views changed over the years of my editorial reign, but the consensus at MAA Headquarters was that it did result in many more MAA members actually picking up MAA FOCUS when it arrived in the mail and reading it. That was why I was asked to write a regular essay for the new MAA Online. Though blogs and more generally social media were still in the future, the MAA leadership clearly had it right in thinking that an online newsletter was very much an organ in which informed opinion had a place. And so Devlin’s Angle was born. When I realized recently that the column turned twenty this year — in its early days we thought of it very much an online “column”, with all that entailed in the world of print journalism — I was curious to remind myself what topic I chose to write about in my very first post. Back then, I would have needed to explain to my readers that they could click on the highlighted text in that last sentence to bring up that original post. For the World Wide Web was a new resource that people were still discovering, with 1995-96 seeing its growth in academia. Today, of course, I can assume you have already looked at that first post. The words I wrote then (when I might have used the term “penned”, even though I typed them at a computer keyboard) provide an instant snapshot of how the present-day digital world we take for granted looked back then. A mere twenty years ago.